If there is one safety razor that experts recommend to any wet shavers, the Merckur 34C is one of the first that they would recommend. This is one of the more versatile razors out there that will help you really get a close shave. The Merkur Heavy Duty Safety Razor is a chrome finished 2-piece razor. The comfortable handle is approximately 3" long and is designed with a thicker grip with non-slip knurling. This shorter length handle makes it quite maneuverable, and provides enough weight that you barely have to apply any pressure during each stroke. This Merkur razor isn’t just for the boys, it’s well-suited for women, too! It works great for shaving legs or getting rid of stubble under your arms. This razor uses all standard double edge blades for a close and comfortable shave and features a 2-piece design. This is the whole shebang. 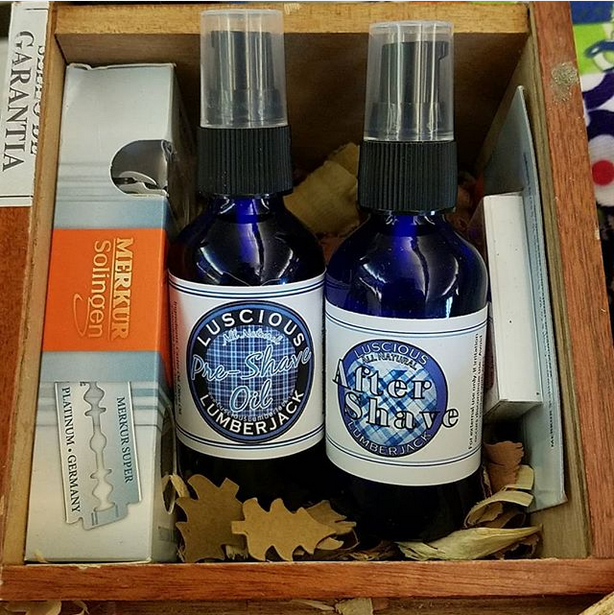 All packed into a re-purposed cigar box. Even the packaging will smell amazing. Our signature blended Pre-Shave Oil is formulated with a unique combination of botanical ingredients and essential oils that are suitable for all skin types, especially those with sensitive skin. It preps your face by softening hair and moisturizing skin. It also acts as a slick, viscous buffer, protecting skin from the blade. This creates a smooth and safe slide, and helps avoid nicks and burns. Instructions: To properly apply a pre-shave oil, thoroughly rinse your face with warm water and apply a few drops of oil to the palm of your hand. Rub your palms together and gently massage the oil onto your face. The goal is to get very thin coverage across your entire shaving area. Allow the oil to set on your skin for at least a minute during which time you can wash the remaining oil off your hands. Apply your soap or cream lather to your face and proceed to shave as normal. It puts the aftershave on its skin... After it shaves. 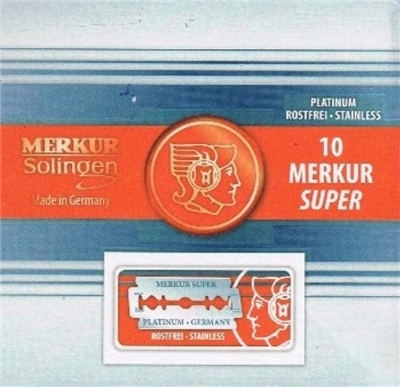 The Classic Double Edge Razor Blades that fit all Merkur and other brand double edge razors. Made of long-lasting "Super Platinum" Stainless Steel each blade is individually paraffin wrapped and contained in a convenient 10 pack dispenser to assure safety, sterility and long shelf life.